“Sills” connect the top of the foundation to the wood floor system. Cracks in foundation walls are caused by shrinkage, differential settling, heaving and horizontal forces. Differential settling is when one part of the house moves relative to another. Bearing walls that are offset from the first floor to the second can cause sloping floors. Most standards require you to enter every attic space if accessible. The three main causes of rot on wall systems are leakage, wood-soil contact, and condensation. Foundation materials include concrete, concrete block, cinder block, brick, clay tile, stone and wood. The Study Sessions will help you make your way through the material. The Quick Quizzes will help you check your progress. Field Exercises are also included to help turn your knowledge into real-world experience. 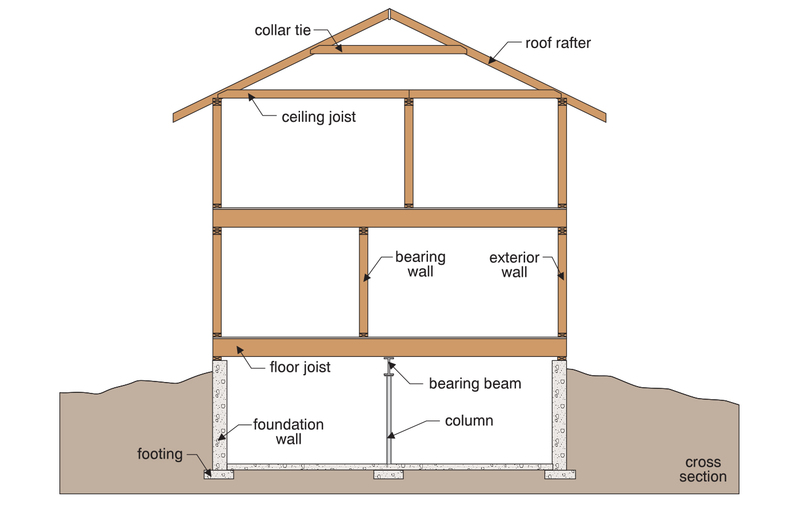 Overview of house structure — This illustration shows that the scope of the inspection includes all of the building structure elements. It is from our Structure Course, Scope and Introduction Chapter. All of our 10 courses contain easy-to-understand illustrations that help you understand the subject.